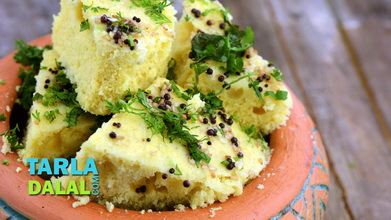 The Rava Dhokla is quick and easy to make, without requiring any grinding or fermenting, yet it is as fluffy and tasty as you would expect a dhokla to be, making it an ideal dish to whip up for breakfast or evening tea-time . 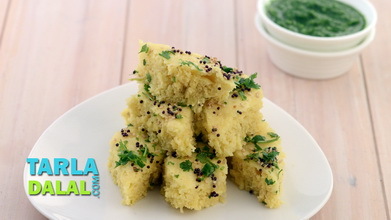 Just mix all the ingredients, let them rest for half an hour, and then steam the batter The tempering added on top of the dhokla after it is cooked is the master stroke, as in the case of any dhokla recipe. 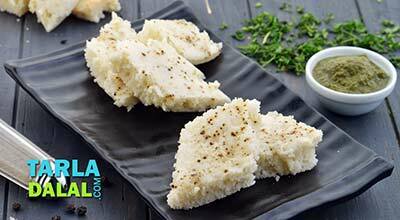 It gives the Semolina Dhokla a fabulous aroma and special flavour. 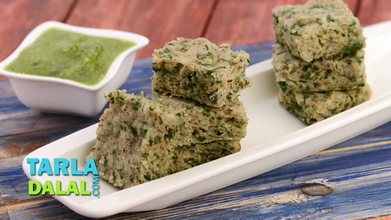 Serve it with peppy green chutney to make a yummy snack. 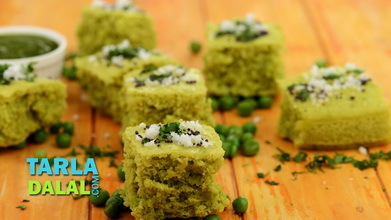 Combine the semolina, curds, green chilli paste, 1 tbsp oil, salt and 1½ cups of water in a deep bowl, whisk well, cover with a lid and keep aside for 30 minutes. 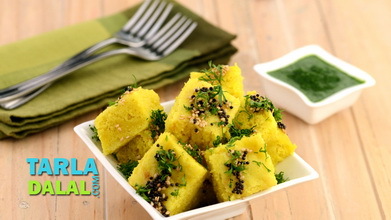 Just before steaming the dhoklas, add the fruit salt and 2 tsp of water. When the bubbles form, mix gently. Pour the batter immediately into a 175 mm. 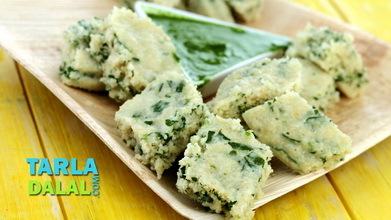 (7”) diameter greased thali and shake the thali clockwise to spread the batter in an even layer. Steam in a steamer for 12 minutes. Keep aside. 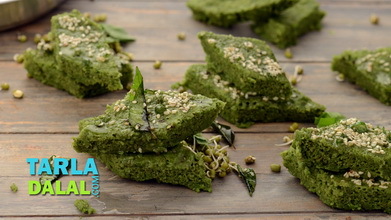 Heat the remaining 1 tbsp of oil in a small non-stick pan, add the mustard seeds, sesame seeds and asafoetida and sauté on a medium flame for 30 seconds. 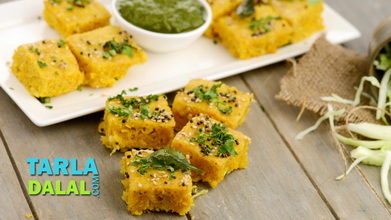 Pour the tempering over the dhoklas, sprinkle the coriander evenly over it. 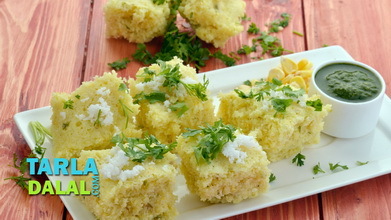 Cool slightly, cut into squares pieces.